Spring has sprung, and here in the Seattle that means that on any given day you can experience gorgeous sunshine, torrential downpour, and gusty winds within the matter of minutes. Really, whatever Steve Pool decides he wants the weather to be at that instant. He makes it rain, you know. At WestToast, Spring is a time for us to get back to our roots. You likely notice a lot of beer and spirits content lately, but we started as a wine blog back in the day and that's where many of our hearts lie. And, like most wine drinkers, we cut our teeth on white wine before progressing deeper into the abyss. Throughout the month of April, our writers will be bringing you features on the white wine that we find to be intriguing this season. 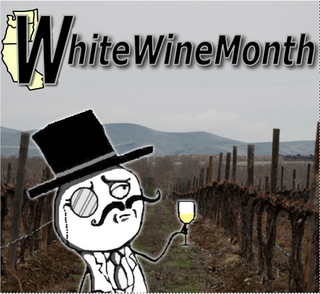 We'll certainly sprinkle in some non-white wine posts like unicorn dust on a field of bright tulips, but you can keep up with the white wine action by following the White Wine Month label on posts or by looking out for our witty and creative White Wine Month image. 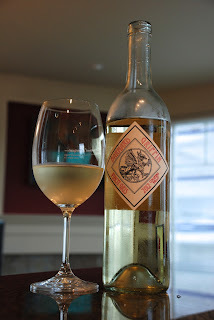 To kick off the series, I bring you the 2012 Barnard Griffin Reserve Pinot Gris. Against the advice of his professors at U.C. Davis, who determined that Washington had too cool a climate to sustain wine grapes, Rob Griffin came to Washington in April 1977 to become Preston Winery's first winemaker. He quickly established himself as an accomplished artist by winning the first Best of Show at the Seattle Enological society's Northwest Wine Festival with his 1977 Chardonnay. Producing two labels, the Barnard Griffin Tulip Series is broadly distributed with a price point of $10 - 20 per bottle, it's one of the best value wines in the industry. I suggest the Fume Blanc and the Syrah. The diamond-shaped reserve label ups the ante with finely crafted whites and some big reds from the best vineyard sites in the state, such as Ciel du Cheval. I found the 2012 Reserve Pinot Gris on sale at my local grocery store for around $12; it looked intriguing so I grabbed a bottle. Upon chilling, the wine poured with a very light, apple-juice look. The wine was clear as day with few legs. Swirling and sniffing, beyond making me look more pretentious than I already am, brought a nice crisp odor with a strong sense of tart green apple. My first sip of the wine was smooth and clean, with that tartness showing up at the end. The apple contented, with some pineapple and tropical fruit emerging as it warmed up a bit. With a very light mouthfeel, I found the wine to be an excellent summer sipping wine. In terms of pairing, this one screams for some seafood such as shellfish. I, on the other hand, paired it with a Red Mill Bacon Cheeseburger and fries. It still worked, but I wish I had some scallops or a shrimp scampi instead. All in all, this was a fantastic beginning of white wine season for me. The Pinot Gris is evidence that Barnard Griffin is still putting out nice whites with an even nicer price tag.